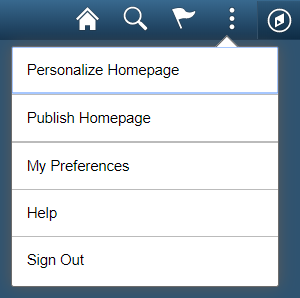 Jim's PeopleSoft Journal: Is Your Fluid Custom Action Menu Page-based or Component-based? I have been trying to find out exactly what you have posted here. We would like to get our custom menu items/links on the mini sandwich (3 dots) menu. Our users are not comfortable clicking on the navigator icon, especially on mobile view. In your post, I cannot see the second screen shot, and could you please share the details guide how to achieve having any menu item, or link into that sandwich menu? 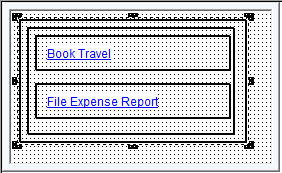 @Daniel, Pages 2-4 of this document on MyOracle Support provides guidance for adding items to the component actions menu: fluid_programming_fundamentals_red_paper_may_2016". Personally, however, I prefer the writeup from my friends at Cy2.nl: 10 Best Fluid UI Controls. Look for item #9. 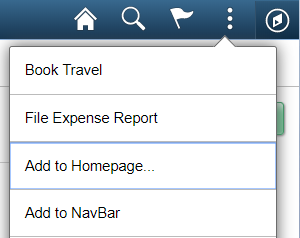 Hi Jim, our users would like to see the same Help link available on the Actions menu from all the fluid pages, available when they are on a Classic page (and using the Fluid-like Theme). I have created my own version of DEFAULT_THEME_FLUID and tried creating a new node on the Header under pthdr2actionlist (type Homepage Help Link) but I can't get it to show up on the Actions menu. Any ideas?